Those who choose to leave by the end of March are being offered a cash incentive of $3,500. The plan has drawn criticism from the United Nations' refugee agency as well as some in Israel, including Holocaust survivors who say the country has a special duty to protect migrants. Eritreans at Holot say Rwanda and Uganda hold no prospects for them, and they'd rather be imprisoned in Israel than embark on another journey into the unknown. 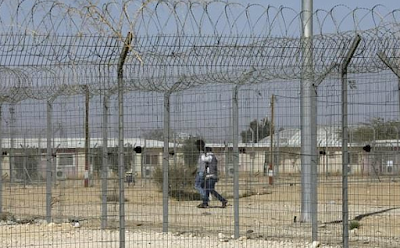 At a detention centre in Israel's Negev desert, African migrants facing deportation say they would rather be imprisoned than sent to a country they know nothing about. "I won't go there," Abda Ishmael, a 28-year-old Eritrean, said in excellent Hebrew outside Holot, an open facility housing some 1,200 migrants and set to be shut down on April 1 as part of the government's expulsion policy. "Guys who were here and went to Rwanda and Uganda -- we saw what happened to them." Israel is working to expel thousands of Eritreans and Sudanese who entered illegally over the years, giving them an ultimatum: leave by April 1 or risk being imprisoned indefinitely. As the migrants could face danger or imprisonment if returned to their homelands, Israel is offering to relocate them to an unnamed third country, which aid workers say is Rwanda or Uganda.